What are you basing that on?! Warmachine: Heavy Metal Rhulic Rules! 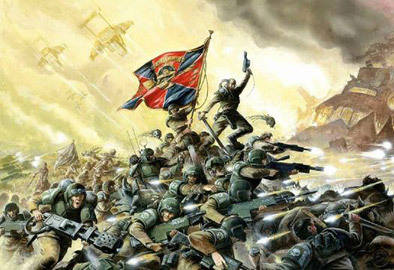 In my humble opinion the Warhammer 40000 (40K) setting is up there with great sci-fi settings like Dune and Star Wars. It might not be so well known by the larger public and full of silly references and humorous nods but at it’s core it’s a very well written setting with some very original approaches. It’s a real shame that GW hasn’t or couldn’t put the setting on the big screen yet. I’m not the only one to think it would have a big shot of becoming a huge success. Especially in the current media hype of fantasy and sci-fi in general. The model range is very iconic and has it’s own look and feel not easily copied or changed without losing that specific 40K “style”. What GW has done with the game rules-wise is another story entirely…and a constant annoyance with many collectors, gamers and fans alike. But that’s a whole other story that shouldn’t spoil the fun. Many years ago I started the hobby with Warhammer Fantasy but soon branched out into 40K as well. I have two main armies; Orks and Space Marines. Ironically these are the 2 forces found in many starter sets but I assure you they are quite deliberately chosen. Or I was brainwashed by GW…again. Orks isn’t really an army for me if I’m being honest. Simply too many models to paint… But they are just so much fun! Hooligans meet Mad Max with their own green sauce of awesome. Waaagh!! 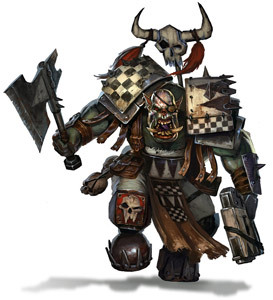 Funnily enough Orks (or Orcs) in fantasy never really clicked with me but put them in a sci-fi setting with some original twists and they are ready to rumble. When I started this army I knew beforehand I’d struggle with painting it. So I promised myself they would be speed-painted or I would get nowhere fast. I found a technique that mostly uses washes that’s ideal for orks. Somehow I don’t mind applying washes as much as I do putting on basecoats so that was another bonus. Marines, I’ve got a love/hate relationship with them. On the one hand I like them aesthetically and many of GW best models over the years have been space marines. But they are so overused it gets very old very quickly. 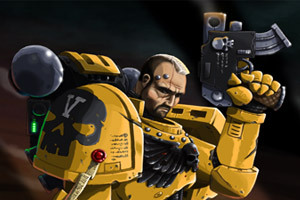 Not to mention that everybody that plays 40K has a space marine army in one form or another. Respect for the few who’ve avoided the golden boys entirely. But there’s also something strangely appealing to them as well. 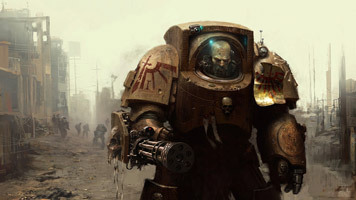 Space Marines may be the easiest army to paint (small numbers, simple strait forward armor with big surfaces) but are one of the hardest armies to paint “well”. With that I mean painting them while taking into account their complex iconography and background information about how their troops and officers display their ranks and colors. Now add to this that it’s extremely hard to be original with them because they’ve already been painted in every color of the rainbow with every imaginable theme plastered onto them…and you suddenly have an intriguing challenge (to me at least). A challenge that has been stewing in my brain for many years now. I’ll even make the challenge a bit more difficult and restrict myself to an “official” chapter that has already been published one way or another but has never really been used by GW or hobbyists. A “DIY” (Do It Yourself) chapter is too easy of course. So my Ork and Space Marine armies have the exact opposite approach to how I want to paint them. Let’s hope it keeps things interesting and won’t bog down my progress entirely. Next to these two main armies I’ve also got a small army of Sisters of Battle. I honestly don’t know if I’ll ever get them collected and painted as a complete army. 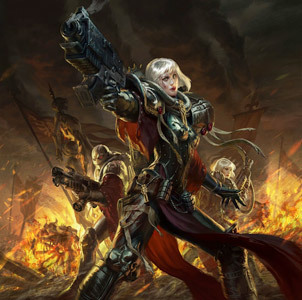 Then they suddenly “re-released” the Sisters of Battle in the Agents of the Imperium… hell has frozen over it seems. Especially now they also re-released the Genestealer Cult as well (bloody beautiful models) But it’s simply too expensive to fill up my collection to reach a playable army of sorts. Thought about selling them several times but I can’t seem to want to get rid of these nuns with guns. Till then they’ll be waiting in a box somewhere praying to be released to the light once more. GW got me. They got me good! 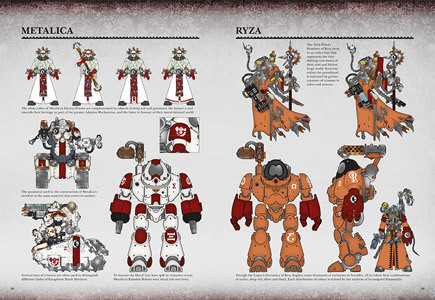 Their new starter boxes are really good value and me and a friend of mine both have been drooling over the new (at the time) Cult Mechanicus models. So we had a weak moment and decided to collectively buy 3 starter boxes to start an army we both can use and make it a joined painting project. Of course we haven’t started it yet…surprise! I haven’t bought any extra models yet but my buddy saw some awesome bargains at his local wargaming shop and also bought 20 Electro Priests and Kastelan Robots. I’m intrigued if we can get this joined project up and running sometime. Especially now my buddy also agreed to start a joined Tau project with another gaming buddy as well. 40k, Adeptus Astartes, Blood Angels, Bloodquest, Cadian, Catachan, Chaos, the Chaos device, the Chaos logo, Citadel, Citadel Device, Cityfight, Codex, Daemonhunters, Dark Angels, Dark Eldar, Dawn of War, 'Eavy Metal, Eldar, Eldar symbol devices, Eye of Terror, Fire Warrior, the Fire Warrior logo, Forge World, Games Workshop, Games Workshop logo, Genestealer, Golden Demon, Gorkamorka, Great Unclean One, GW, GWI, the GWI logo, Inquisitor, the Inquisitor logo, the Inquisitor device, Inquisitor:Conspiracies, Keeper of Secrets, Khorne, the Khorne device, Kroot, Lord of Change, Necron, Nurgle, the Nurgle device, Ork, Ork skull devices, Sisters of Battle, Slaanesh, the Slaanesh device, Space Hulk, Space Marine, Space Marine chapters, Space Marine chapter logos, Tau, the Tau caste designations, Tyranid, Tyrannid, Tzeentch, the Tzeentch device, Ultramarines, Warhammer, Warhammer 40k Device, White Dwarf, the White Dwarf logo, and all associated marks, names, races, race insignia, characters, vehicles, locations, units, illustrations and images from the Warhammer 40,000 universe are either ®, TM and/or © Games Workshop Ltd 2000-2017, variably registered in the UK and other countries around the world. Used without permission. No challenge to their status intended. All Rights Reserved to their respective owners. Images originating from the Privateer Press website are © 2001—2017 Privateer Press, Inc. All Rights Reserved. WARMACHINE ®, HORDES, and their logos are trademarks of Privateer Press, Inc. Images and trademarks used without permission. This website is unofficial and is not endorsed by Privateer Press.